Let me introduce you to today’s guest on the Answers From Leadership podcast. His name is Mike Boyink (his last name is pronounced like the sound effect). Mike is a husband, father, and a techie. And some people say a little nutso. He built a comfortable suburban self-employed lifestyle to provide for his family only to sell off the house, give away most of their stuff, and hit the road full-time. 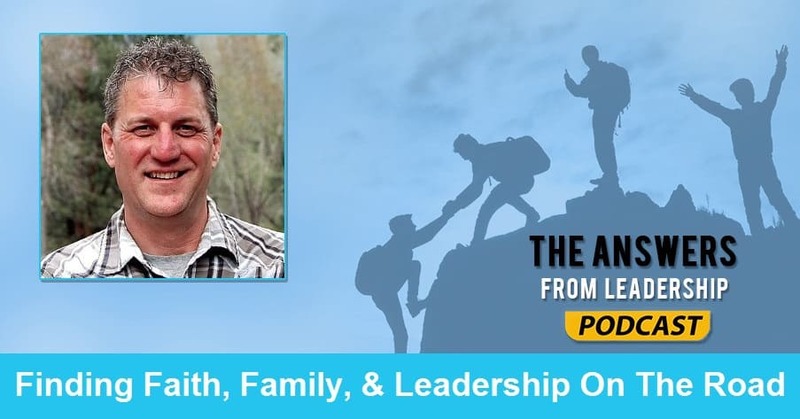 While you might not consider this to be the ideal of a standard leader, I’ve come to find out that leaders need to be leaders of their family as well. Mike’s been doing that consistently while traveling the United States with his family. What else would you like listeners to know about you? I’ve been married for 25 years. We have 2 children together. And we’ve been on the road for 5 years living in an RV. What made you decide to pursue a life of travel? A number of reasons. The tipping point was my oldest turning 13. It felt like I had just put a two-year-old to bed and he walked out thirteen. You could see an endpoint for time together with family. What have you learned from a life of traveling with your family? Yeah, choosing to check out of the formulaic suburban life and figure life out on our own terms. We’ve come to completely reinvent our friends and how we look at colleges. I do warn others when they come to us about doing a similar thing. I ask them if they’re ready to reinvent themselves as a person. You said you reinvented yourself. What does that look like? From a faith perspective, we grew up in West Michigan. We found out that the typical church lifestyle and the traveling lifestyle doesn’t mix so well. You’re moving too much and you can’t keep going to the same church. You wind up being the visitor. Neither the church nor you want to invest in a single church. The main book that’s really been life changing for us has been Finding Church by Wayne Jacobsen. With all your travels, you’re doing a bit of writing and leading others in the is pursuit as well. Where are you doing this? At our blog Ditching Suburbia. We’ve kind of identified 4 core desires in people who do what we’re doing. They are Closer Family, Simpler Living, Richer Education, and Uncommon Adventures. So we’re trying to blog around those topics. How has all of this impacted you? It’s made me aware of how designed our world has become. And how we seem to desire comfort and safety as our primary goals of our lives. Everything about the suburban life seems that it’s about mitigating risk and discomfort. Everything that we have done getting out of the suburbs is about ripping away those layers of comfort. Even in all that we’ve done, we’re starting to get comfortable in our travels. We’re going to have to look at ways of changing it up. It sounds like you’re at the point of getting into another rut? Yeah, it’s really easy to do. We’re back in an area we were at a couple of years ago. It’s easy to want to go back to the RV park we were at before. We know things about it. Through all of this, have you found yourself leading your family or yourself differently? Yeah, I think so. From my perspective, we’re doing a better job at focusing on experiences over stuff. We’re not caught up in chasing down a nicer car or house. What caused you to forget what it was like to dream big? It was a comfortable suburban life. It was almost like a drug. We were living the formula we thought we were supposed to live. I’m really impressed by the young people these days, it seems I meet a lot of younger people who have a bigger worldview than I did at their age. You also mention that you want to live good stories. What does this look like to you? That is just having experiences. It’s funny because I’ve been coaching my kids that you later in life, you’re going to be in these situations, where you’re going to have these stories to tell that no one else has. Those stories will help you stand out and be memorable. Do you have any book recommendations for someone who wants to live a life like yours? The Art Of Non-Conformity by Chris Guillebeau. Everything else he has out there is great too. And do you have any parting words of wisdom for those listening? We’re not trying to pull people out of lives they’re happy with. The people we’re wanting to talk with, picture them with their heads down, walking along, looking at the ground, living a life according to expectations. There are some people will look up and realize they’re not where they thought they were at. That’s the moment we want to intersect with people. If that describes you, come check our site out. Question: How are you leading your family? Share your thoughts in the comment section below.